Two men have died in floodwaters that have forced large-scale evacuations in the Australian city of Townsville. The pair’s bodies were found near a park on Tuesday, following what has been described as a “once in a century” flood in the northern Queensland city. Police did not confirm whether the victims were two men, aged 21 and 23, whose disappearances on Monday had led to the discovery of the bodies. Thousands of houses may have been flooded, officials said on Tuesday. Townsville has received more than a metre (3.3ft) of rain in the past 10 days – the equivalent of the region’s total annual rainfall. Police did not give further details about the two deaths, other than to say their relatives had been notified. At least 19 people found trapped in floodwaters have been rescued since Sunday, according to state officials. In one instance, two police officers were pulled to safety after being forced to cling to trees when floods swept away their vehicle. Volunteer rescuers and the army have used small boats, tanks and trucks to evacuate residents in low-lying areas. More than 1,100 people have been moved to higher ground. On Sunday, authorities were forced to open the gates of the city’s main dam after it swelled to double its capacity – releasing up to 1,900 cubic metres of water a second. Floodwaters had begun to recede in some areas on Tuesday, as Prime Minister Scott Morrison toured the city and praised the efforts of local officials. “I know that we had two deaths confirmed this afternoon but the scale of the evacuations that took place, it was an extraordinary achievement,” Mr Morrison told radio 2GB. However, local officials warned that forecasts of more heavy rain could pose fresh dangers in coming days. 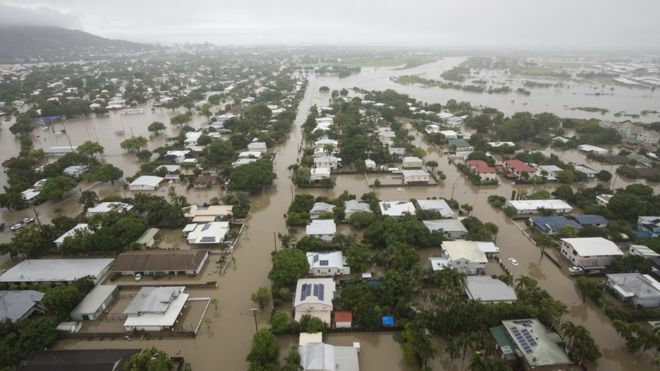 Mr Morrison said Townsville would receive airlifts of food, water and other supplies, and that residents could apply for relief payments of up to A$1,000 (£550; $725). “It is a big clean-up. It will be a big job, but the community is really strong,” he told reporters. People have also been warned after crocodiles, snakes and other wildlife were reportedly spotted in flooded suburban streets. Northern Queensland has a tropical climate and experiences monsoon rain from December to April. But the recent downpour has been described as “unprecedented” by Australia’s Bureau of Meteorology. The level of rainfall has eclipsed records set in 1998 during a disaster known as Night of Noah. “We’ve never seen weather like this,” said Townsville mayor Jenny Hill on Monday. January was the hottest month on record for Australia as a whole, with the southern city of Adelaide reaching a record 47.7C. The heat has sparked bushfires, including more than 40 blazes on the island state of Tasmania which have been burning for over two weeks. Extreme temperatures have also caused a rise in hospital admissions, widespread power outages, and reports of mass wildlife deaths.